I’ve seen children and adults ostracized alike because of their mental illness. The same could not be said of a child or adult who suffered from a physical ailment such as cancer. Those individuals, I found, were always embraced with empathy, warmth and support. As I started covering ethnic communities in Orange County, Calif., I realized that it was common for those with mental illnesses to be stigmatized in these populations as well. While people had sympathy for those suffering from physical ailments, the same sentiment did not translate to someone suffering from a mental illness. I first learned about the severity of the stigma around mental illness in Orange County’s ethnic communities when I wrote an article about a local organization called Multi-Ethnic Collaborative of Community Agencies (MECCA). This nonprofit is an umbrella organization for several Orange County community clinics, which serve different ethnicities in Orange County — Korean, Vietnamese, Latino, Arab, Persian and Chinese. All these communities have one thing in common: severe mental illness stigma. I wanted to take three communities in Orange County that grapple most with this stigma — Korean, Vietnamese and Arab. My goal was to portray what individuals and families are facing in a manner that was sensitive, intimate and human. One challenge I faced right away was the lack of up-to-date data that detailed the gravity of the problem in different ethnic communities. There seemed to be significant anecdotal evidence documenting mental illness stigma in these communities, but numbers were scarce. The other challenge for the agencies I approached was patient privacy. The directors of these agencies wanted to make sure that my newspaper would protect the identities of their patients, if that was what the patients desired. But as it turned out, everyone I featured in my three-part series was open to providing his or her name. Over the course of several months, I visited these community clinics several times. I heard a wide array of stories from their clients. Of course, many did not want to talk at all because they feared they would be ostracized by their communities. A few others who initially talked to me backed out later when they found that the stories would appear both in The Orange County Register as well as the Korean and Vietnamese language newspapers in the area. That would mean all their friends and acquaintances would see their images and read their stories. And that was unacceptable to them. Kwang Ho Kim, a mental health counselor featured in the first story about mental illness stigma in the Korean community, talked about how his own denial of his son’s mental illness led to emotional and financial devastation for his family. Lanie Tran, a mom who gets help from a community clinic near Little Saigon, said she was too proud to ask for help for herself and her children. She didn’t reach out until she became homeless and had to live in a motel. Both the Korean and Vietnamese communities had a lot in common. Both were immigrant communities where families felt the pressure to do well and to keep up appearances. Both are communities were religion plays a significant role in people’s lives. That’s why the community clinics started a program for pastors and religious leaders, teaching them how they can better counsel families facing mental illnesses. The Arab community shared a lot of those commonalities as well, including the use of the word “crazy” to describe mental illness. 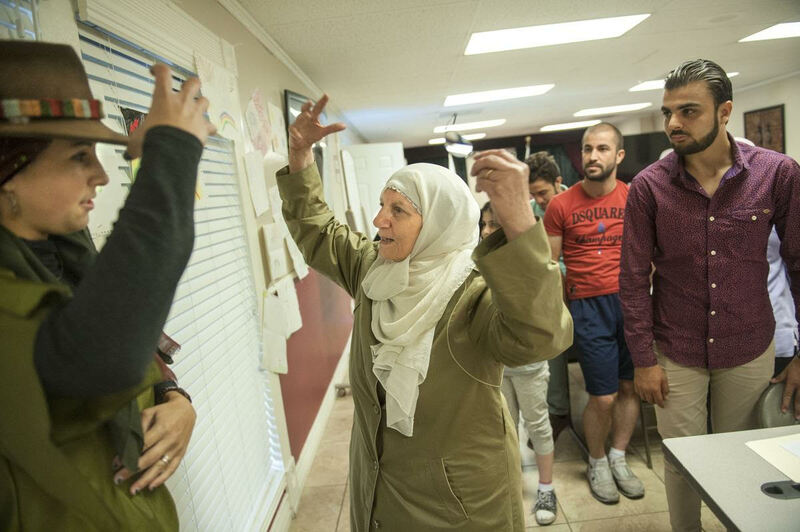 Like the other centers, the Arab center had a discreet, unlabeled glass door through which those seeking counseling can enter. The doors are strategically situated next to an urgent care center so onlookers would believe that visitors were actually going to the hospital, not a mental health clinic. But, one area in which the Arab community is significantly different is that a majority of those who seek help for mental health issues are newly-arrived refugees or asylum seekers from countries such as Syria, Iraq and Afghanistan who are suffering from post traumatic stress disorder, or PTSD. All of these agencies use art programs to reach their audiences. I covered an art class organized by Access California Services, a refugee help organization in Anaheim. Through art, they hoped participants would communicate their feelings and emotions, that they would lose their inhibitions through a non-verbal mode of communication. I could see some of that in action during the art class. The journey to minimize or erase stigma in these communities will be a long and slow one. The biggest challenge mental health workers face is to change the mindset of individuals and communities. They also struggle to get the funding that is necessary to implement these programs to create awareness about the problem and propose solutions. It remains to be seen whether these communities will continue to get the dollars they need to fund these crucial programs and if the programs are able to make a dent in people’s long-held beliefs about mental illness. Read Deepa Bharath's fellowship stories here.